Whether you are a homeowner, home builder or commercial landscaper, Tidewater Mulch and Material is the Chesapeake choice for nursery and garden center items in Chesapeake, Hampton Roads and Northeast North Carolina. From potted plants grown in our hoop houses, to open-field mature trees and shrubs, we have what you want. If you are looking for seasonal plants, shrubs or even full-size trees, avoid the big box stores and come to Tidewater Mulch & Material. All our plants and trees are grown right here on Greenbrier Farms in Chesapeake and we have the largest selection in the area. From small, one-gallon potted plants to burlap-wrapped root-ball trees, we can provide a single planting, or outfit your entire landscape. We also have mulch, stone, pavers, sand and more, and delivery is available. 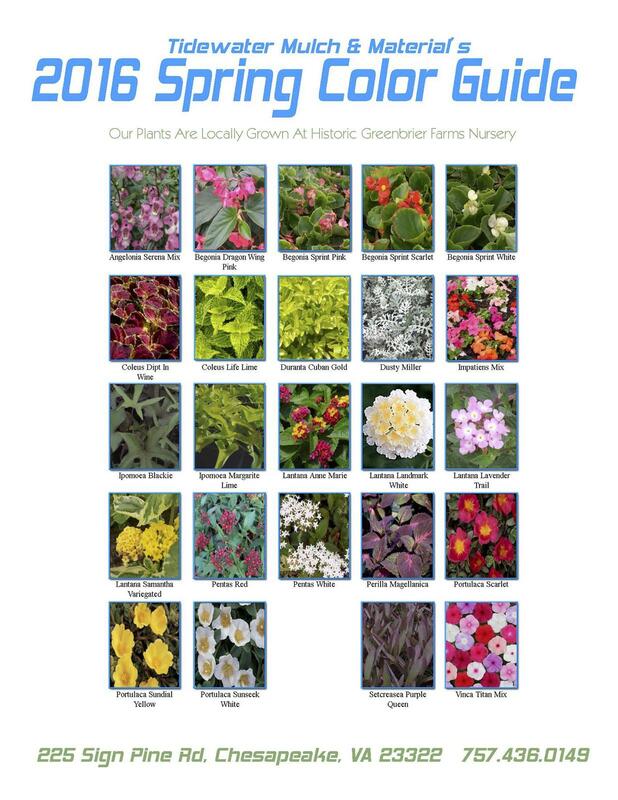 Skip the big box store and find out how good locally grown plants can look in your yard. We also have a full range of power equipment. Our commercial division supplies individual plants and trees, as well as contractor or builder selections to provide starter landscaping for new construction or residential and commercial development. Our nursery is adept and helping you find exactly the right product for the area, soil and time of year. We have a wide variety of potted plants, grown right here in Chesapeake and ready for installation at your building site. Contact us today for builder pricing.